EDIT: Giveaway is officially over. Congratulations to Lindsay McCain for submitting the randomly-chosen 361st entry. Don't rely on your true love to send you a partridge in a pear tree for Christmas - win one for free instead. 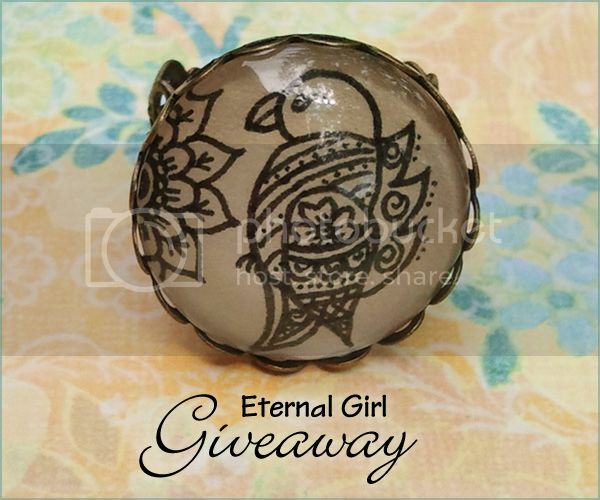 Julia of Eternal Girl is giving away a $25 gift card to spend in her handmade jewelry shop. The pretty partridge ring above is just one of her many henna-inspired designs. From birds to flowers to zodiac symbols, she hand draws each image before placing it into a bronze pendant. She associates her artwork with the undying need to reach out and extend her limitations through love and life. That's why she chose her shop name - "eternal girl" is the female version of puer aeternus, a Latin term used in mythology to describe a childlike god that craves boundless freedom. Use the Rafflecopter below to enter to win gift card sweepstakes before 11:59pm EST on December 5, 2013. Be sure to leave the mandatory comment on the blog post with the same name you use to fill out the Rafflecopter - all entries by winner must be easily verified or a new winner will be chosen. Not including usernames when asked will also get you disqualified. I love the Paisley Necklace! It is international, anyone can join the World? Sunflower Necklace, Hand drawn is my favorite. I like the Lilium Necklace, Hand drawn necklace. I like the Alia Filigree Earrings from the site. I like Plumeria Flower necklace. I love the lilium necklace, its so pretty! I love this etsy store, its beautiful! smpyrrr@yahoo.gr my email and Simona Dotsika is my name!great work!! I like the featured item! The turtle necklace is adorable! I love it! i love the mermaid necklace! I adore the Indian Peacock Necklace. I have an obsession with birds right now and that would go wonderfully in my jewelry collection! I really like the Lotus Blossom Necklace, I like the design on it, it's elegant and cute. The Divine Flower Necklace calls to the hippie child in me. It is so detailed, with the scroll around the perimeter, the bright happy blue flower and the yellow and red center. If I win, I see compliments in my future. I like the floral heart earrings. I like the indian peacock. I like the Divine Flower Necklace, Hand drawn. I love the Hand Drawn Fairy necklace. I also like the Dual Roses Necklace. I love the Forest Leaves Necklace9. My favourite item is the Capricorn zodiac necklace. I love the Floral Heart Earrings. I like the moon and stars necklace, plus the custom drawn rings would make awesome gifts as well! I really like the Owl Necklace, so pretty. I like the Peacock Butterfly Necklace, Hand drawn. I love the lilium necklace. My favorite is the Heart Stitch necklace. I love the Divine Flower Necklace. Colorful and beautiful!